2 Bedroom Detached Bungalow For Sale in Shaldon for Asking Price £130,000. If you are looking for a holiday home that offers home to home comforts then look no further than The Linear. 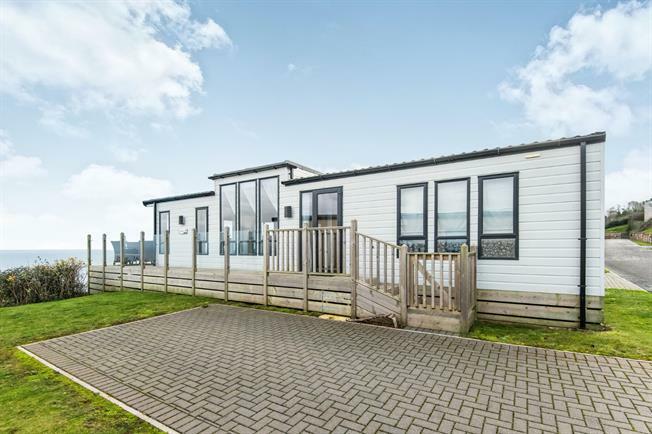 The holiday home also comes fully equipped with everything you would need to enjoy your stay and offers two bedrooms both with built in wardrobes, en suite shower room, open plan lounge/kitchen with integrated appliances and spectacular views out to sea and beyond. This outstanding model offers a huge arrange of standard features and designer touches making the Linear the ultimate luxury escape. Inset led lighting, four Upvc double glazed windows to side offering stunning sea views, range of modern white gloss wall and base units with sleek dark work tops over, inset four ring gas hob with designer extractor hood and light above, integrated dishwasher, washer/drier and 70/30 integrated fridge/freezer, eye level gas oven and grill, inset microwave/grill, inset sink with drainer and mixer tap, built in display unit with glass shelving and inset led lighting, radiator, power points, laminate flooring. Through to lounge area, led lighting, inset surround audio system, Upvc double glazed windows to both sides and Upvc double glazed french opening doors with two glazed side windows to decked seating area, built in modern feature fireplace with slate effect panel and inset coal effect electric fire, smart TV incorporating a DVD player, TV aerial point, power points, radiator. Led lighting, three Upvc double glazed windows to side with further obscure patterned glass below, modern white gloss over bed storage cupboards with concealed lighting below, fitted velour double headboard with bedside cabinets both sides, built in dressing table with mirror and light above, built in white gloss six drawer unit with mirror above and shelf to side, built in white gloss wardrobe with hanging rail and shelf, drawers below, wall mounted flat screen TV, TV point, radiator. Inset led lights, Upvc double glazed window to side, radiator with mirror above, built in wardrobe with hanging rail and shelving below, power points. Inset led lighting and natural lighting tunnel, extractor fan, modern white three piece suite comprising one and a half width shower cubicle with folding glass screen, Upvc panels surround with feature centre row of decorative tiles, vanity unit with inset sink and mixer tap, storage cupboard below, mirror and shelving with led lighting above, low level WC, laminate flooring. Paved driveway parking for two cars, weathered oak effect driftwood decked area with glass panels, enjoy a glass of wine or two relaxing in the outside patio furniture taking in the stunning direct views out to sea, Teignmouth and beyond.